Similar to superannuation, investment bonds offer a tax effective solution for building wealth, with tax on investment earnings capped at 30%. In some cases, this can be even lower after franking credits and tax deductions are applied. This tax benefit is particularly attractive to high income earners with a marginal tax rate higher than 30%. Investment bonds offer other advantages over superannuation, they do not have any restrictions on your initial investment amount, withdrawals prior to preservation age, and there are no limits on subsequent contributions. Another key tax feature of investment bonds is that if the investment is redeemed after 10 years, no personal tax is paid on the proceeds by the investor. If you’re looking for a tax effective, flexible way to save for retirement outside the superannuation system then investment bonds are worth considering. Why are investment bonds so tax-effective? The main appeal of investment bonds is their tax benefits, particularly for those on moderate to higher rates of personal tax and with income surplus to their lifestyle needs. The tax treatment is simple: tax is paid within an investment bond rather than personally by the investor. Plus, when held for 10 years no personal tax is paid by the investor on any future withdrawals. The advantage of holding onto it for at least 10 years is there’s no personal tax payable on withdrawals. The beauty of an investment bond, if we were still to compare against superannuation, is that you can withdraw all, or part, of your investment at any time unlike having to wait until you’re 65. Need money sooner than 10 years? Generation Life’s investment bonds give you complete access to your funds. You can access your funds at any time when you need it. Your money isn’t locked away until retirement unlike superannuation. You decide when to access your investment with no maximum limit on how much you withdraw. If you make a withdrawal within 10 years of your initial investment, there is however a compensating tax offset available, currently 30%, which you can use to offset any personal tax payable in the financial year that the withdrawal was made. This means you only pay the difference between your personal marginal tax rate (if above 30%) and the 30% tax already paid by us on the earnings component of your withdrawal amount. 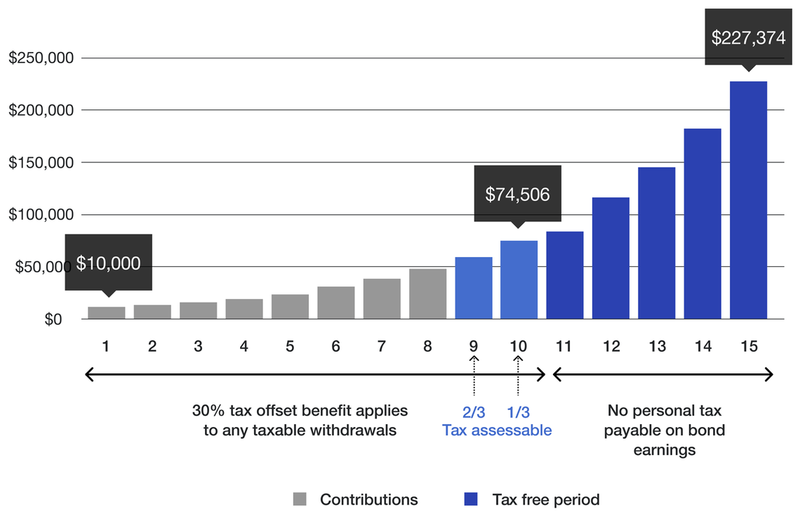 The great news is that there is no tax payable on your net contributions after fees, of any withdrawal amount you make. Unlike superannuation, investment bonds give you much greater flexibility on how much you can contribute. When you first start an investment bond there’s no limit on the amount you can invest in the first year. From that point onwards for each investment year, you can make additional contributions of up to 125% of the previous year’s contribution. These can be made without re-setting the 10-year advantage period. Generation Life offers the choice of 37 investment options and the flexibility to switch your investment options at any time without any tax implications. Generation Life is an Australian leader in investment bonds. We are the number one provider for net funds flows for the last 4 years¹. Our investment bonds have received a Highly Recommended Rating* from Zenith Partners for 10 consecutive years and we provide an extensive investment menu with choice and quality for investors. Generation Life’s LifeBuilder is a tax effective, highly accessible investment solution for people who want to grow their wealth outside the superannuation system. Find out how Generation Life’s LifeBuilder can help you tax effectively save for your retirement outside superannuation now.